We all know the story behind the name for sandwich, but the Italians had their own Lord Sandwich; his name was Vittore Carpaccio, a medieval Venetian fresco painter. Like all artists, he would often forget about hunger in his creative exuberance, skipping meals to save precious time. Once he was so impatient that he could not wait for the meat to be cooked and instead ate the beef raw with some salad. Another legend says that his name became known thanks to his chef who used to prepare his favourite dish consisting of thin, almost transparent slices of raw beef, garnished with olive oil, salt, pepper, lemon juice and parmesan – and the rest is history! This slightly pretentious dish, named after Vittore Carpaccio is now more famous than the man himself. Although often relating to raw meat, carpaccio is much more. Primarily, this means very thinly sliced raw ingredients, one of them being tuna and other high quality oily and white fish. As the story goes, the culinary competition was initiated in mid 20th century by Arrigo Cipriani, owner of the iconic Harry’s Bar in Venice after visiting the exhibition of the great Renaissance master. 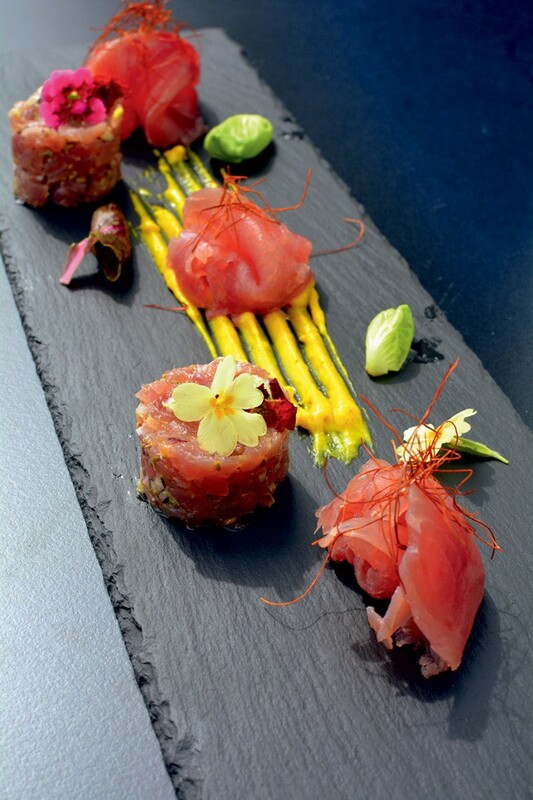 Spellbound by the art and especially the striking colours, he wanted to honour the painter by adding new ingredients to the dish and making it even more sophisticated and picturesque. Among the guests at this exhibition was Countess Amalia Nani Mocenigo who was on a special diet and, following the advice of a respected doctor, was not allowed any cooked meat. So Giuseppe decided to oblige and made a raw meat dish for her. Part of the local folklore is often competition and controversy over who makes the better anchovy carpaccio. It is said that the simpler it is, the better! Fresh anchovies, cleaned and washed, dried, stacked in a pot, topped with lemon juice, salt and pepper and that’s it! Done and done! The lightness and colours of the painter’s frescos with the dominating red are best embodied in the beef fillet carpaccio. Thin slices of half-frozen fillet, stacked on roquette, lightly covered with lemon juice, grated Grana Padano cheese, refreshed with green basil leaves and glittering with olive oil – this is what we see at every mention of carpaccio. To make another impressive dish, which is perfection on a plate, first you will need a regular plastic bottle and an octopus. The result of their joining and permeation is called ‘octopus carpaccio’. Let us elaborate: cook the previously frozen octopus, cut it into larger pieces, squeeze them into the plastic bottle, then cut in the middle and place into the freezer. After removing the plastic, you have a delicious roll of tasty meat which you now must cut into slices as thin as possible. Add only a few drops of lemon, olive oil, balsamic vinegar and a few grains of fine salt and aromatic pepper. At Navis, the design hotel in Opatija, Chef Nenad Posavac combines the five hotel stars with his rather star like status when it comes to Croatian cuisine. In his kitchen, located – like the entire hotel – on a steep cliff above the sea, Nenad Posavac creates new strategies to greet the guest through delicate senses, such as scents and flavours of the Mediterranean. Famous for the national TV culinary show ‘Pears & Apples’, Chef Posavac is bringing back to Opatija the forgotten flavours of seafood, known today only to the sophisticated gourmets. ‘Bold compositions of seemingly incompatible ingredients are part of my higher goal, which is to always offer a story to the guest. A classic is always a classic, but the challenge lies in the alternative. However, even the imagination must have a base and Spanish cuisine was mine. Pakistan and Morocco opened the doors to exotic cuisine for me. ‘It is like a fine spice, always at the end of my combinations which I send out only when I am convinced that they are no less than perfect’ says Chef Posavac, adding that he named his new direction ‘the raw program’. Snails, anemones, urchins and roe are all food from ancient times. Anemone, for instance, tastes very much like veal brain and very subtle sensations in its tentacles, calls to mind a non-existent peperoncino. It is this sea flavour that matters, the salt, even a little bitterness. ‘I love thinking about tuna and all the possibilities it has to offer! It is the best raw meat in the world. One absolutely must not ruin this powerful, noble meat by torturing it with excessive spices and sauces. 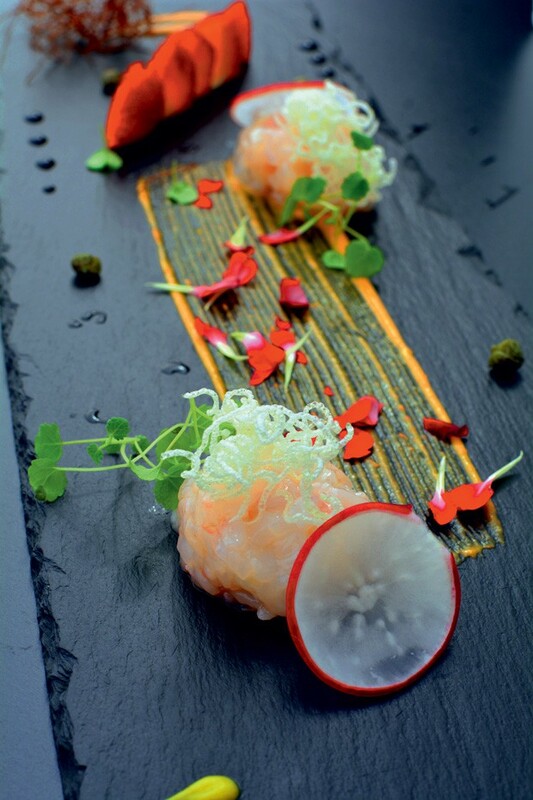 The idea behind carpaccio is to emphasize the taste of raw fish. When you have the skill and follow your philosophy, it is impossible not to draw the attention of those who cherish food as much as I do. Therefore, I give my best to the guest and I believe that in our world today, it is the details that make a restaurant special’, Chef Posavac concludes. She-devil, Frog, Werewolf, Monster – these are all local nicknames for one of the ugliest fish in the Adriatic – the Monkfish. Its mouth may look like the gates to hell, but its meat tastes like it came from heaven. This is why the monkfish carpaccio is always a very special treat. 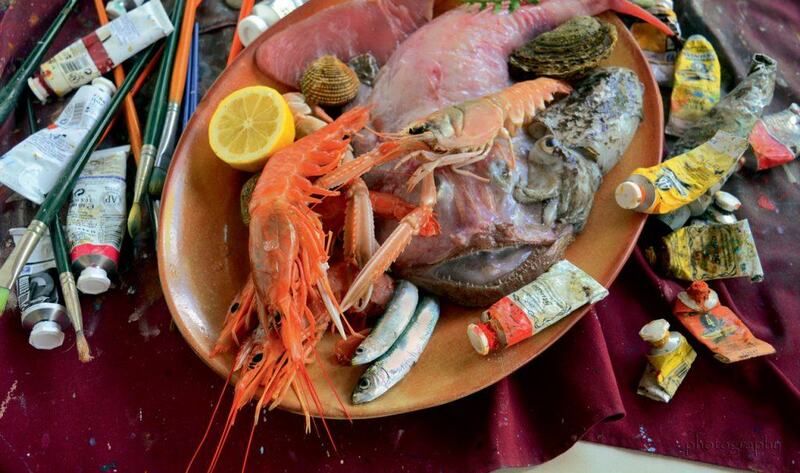 At the Gatto Nero restaurant in Novigrad the tradition of fishing and the richness of the sea is combined into outstanding seafood and fresh fish based gourmet experiences. Octopus and monkfish are prepared in the simplest of manners, yet they are so very unique and appealing. The restaurant’s Chef Jasminka Bojanac is aware of the crucial element, which is diversity in preparing fish dishes. ‘Boiled meat is a health delicacy par excellance. It is at the table usually followed by roasted meat filling us up the fastest; raw meat, although the rarest in our homes, is a new source of inspiration at our restaurant. It is the reason for our guests to return and bring new fans of our food ideas. Boiling, roasting, frying… are only methods of food preparation, while seafood carpaccio brings out the perfection of Adriatic ingredients in all their purity and health’, says Chef Bojanac. At the Gatto Nero, beautifully located in the heart of Novigrad medieval old town – where you will find buildings full of character, palaces, walls and towers; carpaccio is the most original introduction to any lunch or dinner, or perhaps – and why not – a meal on its own. The meat carries all the essences of deep seas and the flavours leaking from shells of the crustaceans emit scents of the places they grew. To a wise chef, each complement is just a way to highlight those basic treasures even more, unspoilt by thermal processing. For a while now, Istrian culinary scene has not produced a chef showing promise to become a top chef, with ideas that would be emulated by everyone eager to leave at least a small trail in the culinary history. A gem just like that is hidden in Poreč, in a small restaurant called Ćakula – its name meaning ‘small talk’, suggesting you will spend your idle hours here. This restaurant very ambitiously creates its cuisine, thanks to the coy Chef Dejan Premužić, who unknowingly pushes the boundaries of the conventional. He bases his ideas on the possibilities of combining the courses, each modern and unique – an independent meal (‘piatto unico’). He adds colour to Mediterranean flavours, enriches them to the point of a firework; to the eye, to the pallet, to the health and soul! ‘Baby-beef fillet carpaccio is an excellent base for a plate proving that it is the main impression that counts and when you place, for example, an artichoke on top – looking beautiful whether served hot or cold, with leaves or stripped to the bone – you have a delicacy with countless healing properties. I focus on vegetables more and more often. Raw, of course. Nutritionists have long ago recognized the value of vegetables in terms of vital fibres, vitamins and minerals they provide and I am all about the beauty hidden in their colours. These days I include zucchini a lot in my menu because they have such gentle edible skin, while the orange flowers, also edible, make a surprising and appetizing decoration. Beetroot has edible leaves too; apparently the old civilizations only ever ate the leaves, but I also find the strong red pigment of the root very inspiring. Beetroot carpaccio, much like the baby-beef fillet, provides an outstanding base on which to play with colours and flavours’, Chef Premužić tells us. If we want to keep up with the time we live in, when everything is changing and evolving in all areas, we need to change our philosophy in cooking. These are the requirements of the modern time. We must reduce the cooking time, simplify the plate, even if it has a million details and only one ingredient is to be the star of the dish. Fashion and trends will always exist: they do not need to be blindly followed, we each have to develop our own style – and the secret is in the inspiration arising from one thing and one thing only – passion!